Today is a big day for our friends and client, Virtrium Ltd. Today they celebrate ten very successful years of trading and, to coincide with this milestone, they have launched their new lifecycle website. A strategic brand and new website. Produced by Design Inc, may I just add! This is not the first time that Design Incorporated have supported Virtrium however. We were there right from the beginning – and were responsible for the creation of their original brand & strategic brand collateral. At that time, the creative brief was agreed to develop a brand inspired by technology – based on the feel of the name they had registered. Four years later, in 2011, Design Inc undertook a series of strategic brand workshops with Virtrium to help the directors define the purpose position of the company. This needed to demonstrate more prominence for the company’s commercial understanding and the business improvement they deliver for their own clients. This led to a more timeless, approachable and ‘professional services’ feel being brought to the logotype and brand. Moreover, their website was wholly revamped at that time and new brand assets including an imagery hierarchy and illustrative atomic strand device were introduced. The scope of work at this time also included developing a range of templates for stationery and other marketing collateral such as case studies, whitepapers, templates, etc. The use of an atomic structure was devised to show that IT competency was core to the company’s being. Their knowledge, skills and competencies could be used in a myriad of ways to create a totally different business structure. 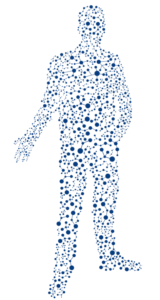 And, as such their core brand assets included imagery shapes made up of the atoms. This included a butterfly, tree, magnifying glass, industrial cogs, jigsaw piece and an umbrella. The overarching atomic image was ‘atom man’, created to act as a ‘brand ambassador’ for the company. You can see more of this branding work on pages 56-62 of our Branding Portfolio. Over the years, as their clients’ needs evolved, so did the company’s business architecture. 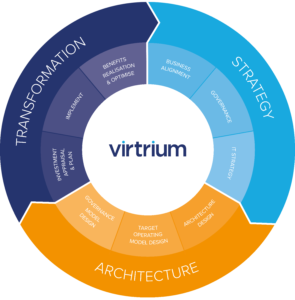 And, at the tail end of 2016, Virtrium once again called upon our support to make the existing website even more relevant for their restructured competencies. This was, of course, an ideal opportunity to build upon the existing website, making it responsive for better performance on hand held devices and through search engines. We created a new ‘competency wheel’ dividing their offerings within three segments: Strategy, Architecture and Transformation. 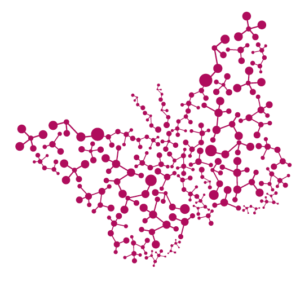 All designed to emphasise the lifecycle approach that Virtrium’s joined-up services now offer. We congratulate our friends on their ten years of trading and wish them all the best for their next ten. For more details about how Design Inc can support you with your own branding project, contact our Client Services Director, Frank Norman or our Branding Consultant, David Parker.